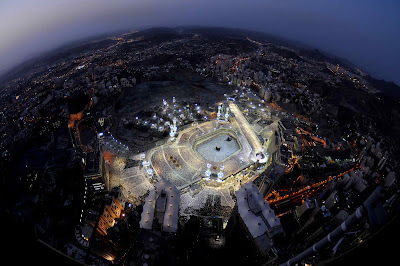 Mecca, the spiritual magnetic pole of the world - an aerial view, taken on Sunday, the 27th night of Ramadan 1431 A.H. shared by Sumayya Essack. Click on the image above for enlarged version. I Am the Will holding Heaven and Earth in place. I Have given you sight only so you may see Me. but you do not smell Me. I become savory food yet you do not taste Me. Or breath Me in through your sweet perfumes? No one is deeper within you than I. But I love you for yourself. It is only because I have taken a hundred toward you. I Am closer to you than yourself. Closer than your soul, than your own breath. Why you do not see Me? I want you to see Me - and no one else. Dear one! Come with Me. Let us go to Paradise together. We will destroy that road. this wondrous union of Ours.